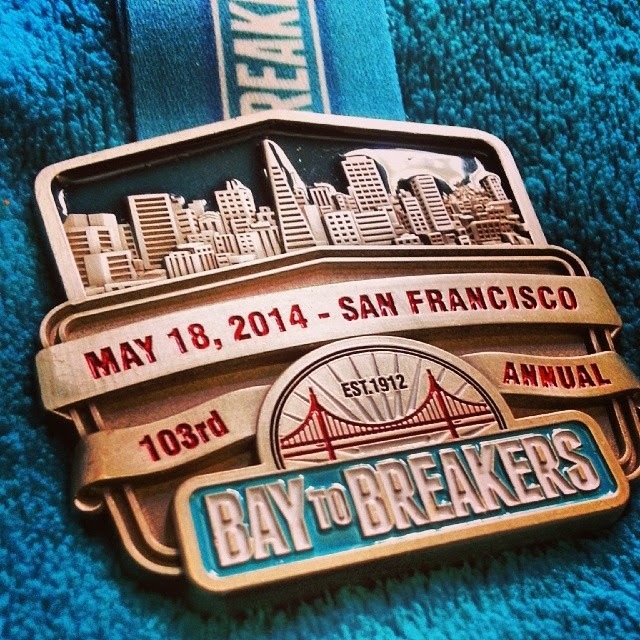 I was afraid to write about Bay to Breakers beforehand this year. I wanted to, but I wasn't sure what I would say. It's been two years (to the day, today) since the perfect day that was my first Bay to Breakers. So much about my life has changed since then. Some good, some bad, all emotional. I knew in advance that even though it had been two years since I'd run this race, I was going to do better than last time. Two years ago I was truly a novice runner. I had no idea, at the time, that I could run 7+ miles, because I'd never done it before. Flash forward to now, and I've been training for my second half marathon since March. I've been running 6-8 miles every weekend (at a time) for a couple of months now, and it's not really a big deal for me anymore. In fact, I really look forward to them, and they're part of my weekend routine (as is the brunch that comes afterward ... hallelujah!). So, up to the race this time, I was sort of fighting the idea that this race, and this distance, might not really be a big accomplishment for me anymore. After all, I was running at least that much on weekends already. I don't like thinking that way, however. Every race is an accomplishment. I don't want to become one of those people who can only run half marathons or something. Luckily? I really had nothing to worry about, because this Bay to Breakers was just as special as the last time. So, I felt prepared. And I even had some goals, this time, which I don't usually do. My reasonable goal was to finish with an 11:30 minute/mile average. Last time, I finished with a 12 minute mile average, and I'm a much better runner now, so I thought this was a reasonable goal. I also had a crazy (reach for the sky!) kind of goal to finish in 1 hour, 20 minutes. I realized that was extremely ambitious, especially because there's always so many unknowns in a race that can impact your pace. I had no idea how I would do, but I wanted to give it everything I had. I was serious. I don't know if it's worth going through all the details, except that I totally nailed it. I finished in 1:21:27, a 10:39 per mile average. I very almost hit my crazy goal of 1:20, which I now realize was misinformed -- I had no idea that would mean a 10:30 average, when I made that goal, I just liked how the number sounded. Never in my wildest dreams did I think I would run a sub-11 minute average over 7+ miles, not on race day, not on a day where I didn't sleep great, not on a day where I had to navigate drunk, costumed people and certainly not on a day where I had to tackle the Hayes Street Hill. But I did it! Yet again, I put my mind to it, and I did it. And everything about this day was perfect. Afterward I met the boy in the upper Haight and we enjoyed an early lunch at the Citrus Club, aka the exact same place I went to after my race two years ago. And we ran into Susie and Jeff, who took me to Citrus Club two years ago -- of course we did. After a trip to The Fizzary for some sodas, we headed home. After a shower, and some lounging around, we went to a late lunch, saw the fantastic Godzilla movie (so good! so good! SERIOUSLY) and returned home afterward to eat cookies & watch Star Trek until I fell into the world's most amazing sleep at 10:30pm. What a day. What a race. So proud of myself. This one, as always, was for you, dad. 11 years today. I miss you always. Good for you! It's so great to hear the day was so successful for you, Amber. And almost breaking 1h20m? Impressed!